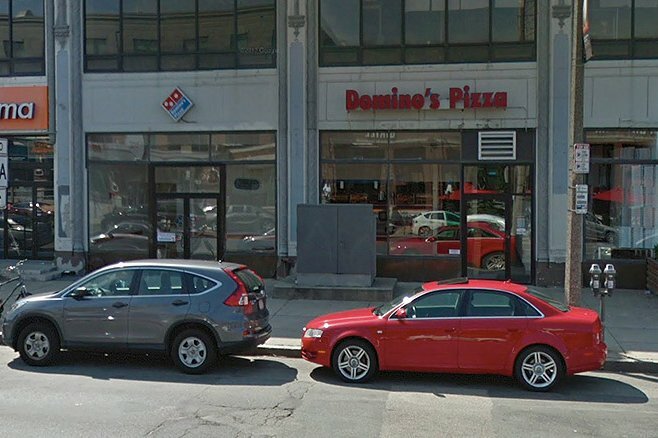 The Domino's Pizza shop on Boylston Street in the Kenmore section of Boston. A South Jersey police officer was indicted Tuesday after an altercation at a Boston pizza shop with the cousin of actor Lindsay Lohan. Daniel Hunt, 27, a resident of Barrington Borough, Camden County, and an officer with the Haddon Heights Police Department, and a Philadelphia man, Ian Salerno, 29, are charged with assault and battery, according to prosecutors in Massachusetts. The defendants were involved in a confrontation with Kevin Lohan of Cold Harbor Spring, a cousin to Lindsay Lohan and a Boston College hockey player, according to news reports. The incident occurred at a Domino's Pizza store on Boylston Street about 2:30 a.m. on Jan. 19. According to prosecutors, police were told by Kevin Lohan's girlfriend that they were in line when a group of six to eight people started pushing. Hunt confronted and allegedly pushed Kevin Lohan, starting a physical altercation. Amid attempts by both sides to break up the fight, Salerno allegedly came up behind Lohan and punched him in the jaw, knocking him to the floor. Lohan's jaw had to be wired shut for three weeks, and he now has permanent metal plates implanted in his jaw and cheek, prosecutors said. Hunt was off duty at the time of the incident. On Thursday he remained listed as a patrol officer on the Haddon Heights police web site. Both suspects are scheduled for arraignment on August 1, the Associated Press reported. The wire service said home numbers could not be located and prosecutors did not know if the men had retained lawyers.